Census tracts are important for many reasons. It is easy to misidentify or misunderstand patterns and characteristics within cities, counties and metros which can become blurred using these higher level, more aggregate geographies alone. Many cities and counties that might be experiencing demographic-economic decline will often have bright spots that are groups of a few or many census tracts. Use the interactive table in this section to view, query, rank, compare general demographics for all tracts in the U.S. Data in this section are based on the American Community Survey (ACS) 2015 5-year estimates. Access to the interactive table below requires your ProximityOne User Group ID. Join now. There is no fee. ACS tract/small area estimates lag by four years or more between the current year and reference year. There are not annual estimates but estimates based on a 5-year survey. Use the ProximityOne annual tract estimates and projections 2010 through 2022 for current estimates and anticipated change 5 years ahead. The following graphic shows median household income (item E062 in interactive table below) by census tract based on ACS 5 year estimates. Click graphic for larger view, more detail and legend color/data intervals. This map illustrates the geographic level of detail available using census tract demographics and the relative ease to gain insights using geospatial data analytics tools. - View developed using CV XE GIS and related GIS project. 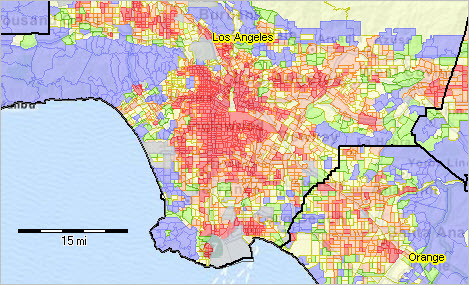 The following graphic shows the same subject matter as above for a portion of the Los Angeles metro. Accommodating different demographic-economic thresholds/patterns, different legend color/data intervals are used. The pattern layer is set to 80% transparency enabling a view of earth features. Click graphic for larger view, more detail and legend color/data intervals. Use this form to request a no fee map graphic similar to the one shown above for a county of interest. Enter the request with county name and state in the text section; e.g., "Requesting economic characteristics tract map for Cook County, IL." Use the interactive ranking table in this section to view, query, rank, compare economic characteristics of the population, households and families in these areas. The scroll box shown below lists each of the subject matter items available for each area via the ranking table. The number at the left of the subject matter item is also used as the short name for the subject matter item in the column header in the ranking table. .. a few item names and numbers changed from previous year data/table. - Click ShowAll button. Click State dropdown and select California. - Use horizontal scroll bar to make column E062 visible. - Click once on E062 column header then click once more on E062 column header. - Scroll down to 1st numeric value: tract CA-081-605600 has the highest $MHI among all CA tract codes: 250,000 (top-coded value). Access to the table data requires a User Group ID. Join now. There is no fee. - enter 11-character State+County FIPS code in edit box at right of Tract button. - click Select Tract button to view/analyze selected tract. - enter 5-character State+County FIPS code in edit box at right of StCty button. - click StCty button to view/analyze tracts in this county. - get 5-character CBSA code from scroll section at right above table. - enter CBSA 5-character code in edit box at right of CBSA button. - click CBSA button to view/analyze tracts in this CBSA. Create a similar view using the default US1.GIS project distributed with the CVXEGIS software. 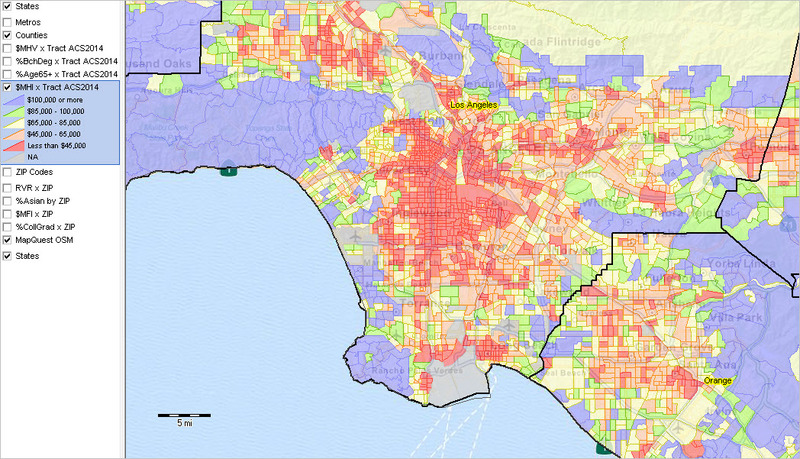 Census tracts are important for many reasons.  Covering the U.S. wall-to-wall, census tracts are the preferred "small area" geography for superior data analytics. .. there is an evolving time-series at the tract level creating new analytical opportunities.  Originally developed to equivalence neighborhoods, many still do. .. tracts typically reflect boundaries meaningful for local area analysis. .. and non-changing for ten years and many much longer. .. there are more than twice as many census tracts (73,056) than ZIP code areas (33,129).  Tract boundaries are well-defined; unlike ZIP code areas which are subject to multi-sourced geographic definitions. .. enabling more effective use of those data with Census Bureau census tract data. .. data at the census tract level can be aggregated to the county level.  Small area estimates for tracts are typically more reliable than for block groups. .. census tracts are comprised on one or more coterminous block groups. .. on average, a census tract is comprised of three block groups.  Census tracts are used by many Federal, state and local governments for compliance and program management. The ACS provides "richer" demographic-economic characteristics for national scope census tracts. While Census 2010 provides data similar to those items in the General Demographics section, only ACS sourced data provide details on topics such as income and poverty, labor force and employment, housing value and costs, educational participation and attainment, language spoken at home, among many related items. The approximate 600 items accessible via the tract dataset are supplemented by a wide range of additional subject matter. ACS census tract data are updated annually in December of each year. Summary of steps to use the "Find tract code based on address..." tool located in the upper right of this page.  Enter an address in the three line form (no ZIP code).  Click Find button and the census tract and related geocodes are returned.  Copy the last 11 digits of the returned GEOID to clipboard (e.g., 06085508101).  Paste that value in the edit box to the right of the "Select Area" button below the interactive table.  Replace the first two characters (e.g., 06) with the uppercase USPS state abbreviation (e.g. CA).  Click the Select Area button; the table refreshes with the selected tract. .. optionally right click the row and copy tract attributes to clipboard. .. paste in application such as spreadsheet program. .. join us in a Data Analytics Lab session to review use of operations.  Table empty? Click the ShowAll button then click Select Area button again. Use the Location-Based Demographics tool to view a demographic profile for an address.